The Indiana CORE Assessments for Educator Licensure, developed and administered by the Evaluation Systems group of Pearson, are fully aligned with the REPA Indiana Educator Standards. Since the REPA Standards are used by Indiana educator preparation programs to document the alignment of their programs with the state's teacher licensure requirements, the best preparation for the tests is to have studied consistently throughout your time in college. When you are preparing to take the test, the best strategy is to study systematically and effectively. Remember that you are not only preparing for a test but also reviewing content that will be an important part of your responsibilities as an educator. learn strategies for successful test taking. For information regarding who must take the Indiana CORE Assessments for Educator Licensure and which tests must be taken, visit "What Tests Do I Need to Take" on the program website. 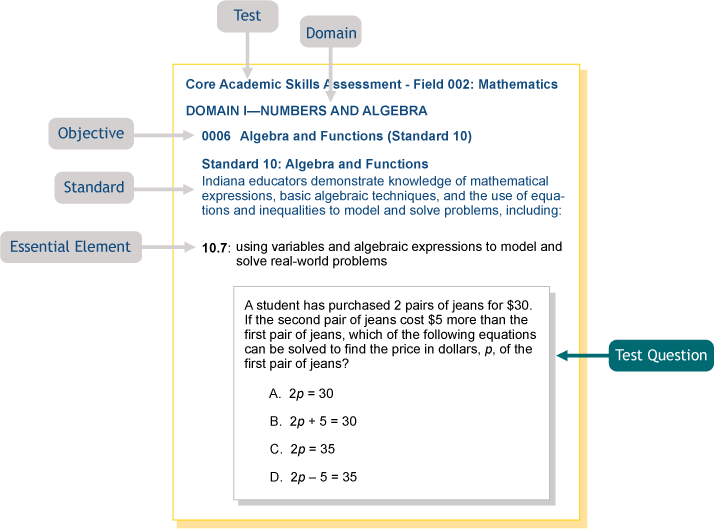 The skills and knowledge assessed by the tests are described in the assessment blueprints, available on the Indiana CORE Assessments for Educator Licensure website. To view or print the assessment blueprints, click on "Prepare" and then "Assessment Blueprints," and select your field from the dropdown menu. The assessment blueprints describe the content that is eligible to be measured for each test. The assessment blueprints are based directly on the REPA Indiana Educator Standards and (where applicable) the relevant student academic standards for that field. For testing and score reporting purposes, the standards are organized into content domains, objectives, and essential elements of knowledge. These components are described below. Domains. Each domain represents a major area of content and includes one or more test objectives. The domains structure the test content for both preparation and score reporting. Together, the domains indicate the main areas of knowledge and skills important for the effective beginning teacher or, for the Core Academic Skills Assessment (CASA), the knowledge and skills in reading, writing, and mathematics that are required for admission to an Indiana educator preparation program. Objectives. The objectives are the key elements of the test structure. Each objective corresponds to one or more REPA Indiana Educator Standards. The objectives are intended to be broad, meaningful statements of the knowledge and skills important for effective beginning teachers or for those seeking admission to an Indiana educator preparation program. The objectives define the range of knowledge and skills to be measured by the test. Essential elements. The essential elements further define each objective and its corresponding standard(s). An essential element provides more detailed information about the content of an objective by including examples of the types of knowledge and skills covered by the objective. Essential elements are intended to provide only examples of the content of an objective, and do not cover the entire range of knowledge and skills represented by an objective or by the standard(s) that the objective addresses. Test questions. The test questions, which may be either multiple-choice questions or constructed-response assignments, are designed to measure specific content defined by one of the objectives. The following example illustrates the relationship of a multiple-choice question to its corresponding objective and set of essential elements in the Core Academic Skills Assessments (CASA). Step 1: Read the assessment blueprint and accompanying REPA Indiana Educator Standards for the test you are preparing to take. Reading the assessment blueprint will help you familiarize yourself with the structure and content of the tests, and begin assessing your degree of preparedness to take the test. The assessment blueprint and the REPA Indiana Educator Standards on which it is based are the only sources that specify the knowledge and skills measured by the Indiana CORE Assessments for Educator Licensure. Read each objective and its corresponding standard(s) and essential elements carefully for a more specific idea of the knowledge and skills you will be required to demonstrate on the test. Step 2: Read the sample question for each objective, attempt to answer it, and review the rationale provided. This will introduce you to the types of questions you will see on the actual test, help you understand how the questions are aligned to the objectives, and show you how the correct response was derived. Once you are familiar with the test objectives and their corresponding standard(s), try to answer the sample test questions for the test you are required to take. The sample multiple-choice questions were developed in conjunction with the questions that appear on actual tests and are the best example of the types of questions that you will encounter. After reading a question, you may want to reread the objective and corresponding standard(s) to see how the question is aligned to the objective. This may help you understand what questions associated with particular objectives might look like. After answering a sample question, look at the correct response and read the rationale provided. If you answered the question incorrectly, you may need to do some additional studying of the content covered by that objective. Step 3: Develop a study plan to focus your studies. You may wish to consult with faculty at your educator preparation program to determine the best time for you to take the test. In your coursework to date, you should already have mastered most or all of the content that you will see on the test. At this point, the best preparation is to identify: 1) your areas of strength and weakness, particularly the sample questions you answered incorrectly; 2) any content with which you have had difficulty in the past; and 3) any other content you have not yet mastered. You should then study areas you have not yet mastered systematically and effectively. Identify the most appropriate resources. These may include your basic textbooks from relevant courses; your class notes and other assignments; textbooks currently in use in Indiana elementary and secondary schools; and publications from local, state, and national professional organizations. Develop a study plan schedule. A carefully thought-out plan will enable you to cover the material you need to review before your test date. Some people find it helpful to study with other people who will be taking the test by forming or joining a study group. Consult your advisor. To determine if the courses you have taken covered the breadth of content that will appear on the test, you may wish to review the assessment blueprint with your advisor. For example, you may wish to make a list of the test objectives, writing next to each of them any courses you have taken that covered that content. If there are any objectives not yet covered in coursework, your advisor and professors may be able to help you identify additional classes you should take, or additional materials that you can study from, to improve your knowledge in those areas. While concentrating your studies on your areas of weakness, you should also be sure to do some additional preparation addressing the content covered in the other objectives. Remember, your score on the test is based on the total number of questions that you answer correctly; therefore, improvement on any objective will increase your total score on the test. Finally, you may also want to do some additional studying in the content domains which contain the greatest percentage of test questions, as they will contribute the most to your total test score. One study method that many students have found to be effective is "PQ4R," or "Preview, Question, Read, Reflect, Recite, Review." After reviewing the assessment blueprint for your test, locate appropriate study materials such as textbooks; then apply the six steps of the PQ4R method as described below. Question: Based upon the appropriate assessment blueprint and educator standards and your preview of the study materials, think of specific questions to which you would like to find answers as you study. Write these questions down and use them as a guide as you read. Review the following strategies to help you do your best when taking the Indiana CORE Assessments for Educator Licensure. Follow directions. Read, listen to, and follow all test directions. Pace your work. The test session is designed to allow sufficient time for you to complete the test(s) for which you registered. At any point in the test, you will be able to see how much time you have remaining. You can also go to any particular question within a test at any time before you submit the test. If you have any difficulty answering a question, you may flag it for review and return to it later, but you must respond to the questions, including those flagged for review, during the allotted time. If your test contains constructed-response assignments, remember to leave enough time to respond to the assignments. Read carefully. Do not try to save time by skimming directions or by reading the test questions quickly. You may miss important information and instructions. Determine the "best answer." Your response to each multiple-choice question should be the best answer of the alternatives provided. Read and evaluate all four answer choices before deciding which one is best. Guess wisely. Your multiple-choice results will be based on the number of questions you answer correctly. Attempt to answer all questions. Since you will not be penalized for incorrect responses, it is better to guess than to leave a question blank. If you are unsure about a question, use your knowledge of the content area to eliminate as many of the alternatives as you can; then select from the remaining choices. Respond to constructed-response assignments fully and clearly. If you are taking a test with a constructed-response assignment, be sure to read and respond to each part of the assignment. It is important that your response fully addresses the assignment. For some test takers, the Indiana CORE Assessments for Educator Licensure is part of your application to enroll in an educator preparation program. For others, taking the test is in preparation for entering the profession of teaching. With the help of these test-taking strategies, you should be able to use the time before and during the test wisely. There are also a few things you can do after the test that may be helpful to you, whether or not you have passed the test. First, it may be useful to review the list of objectives and standards you used during your studying. Look over that list and mark the objectives that represented the most difficult content for you on the test. Whether or not you pass the test, you may wish to enhance your own knowledge with further study in those areas. Also, when you receive your score report, you will learn which content domains were more or less difficult for you. Devote further study to the content of the domains in which your performance was the weakest. Remember that all the objectives that were tested have been identified as important to being an effective beginning educator in Indiana.